Sony vpl-vw365es HRD Review | Dont Buy until You Read This.! Sony is a giant and surely one of the best companies in the market is specialized in manufacturing gaming entertainment and electronic products which are known for their quality and durability today I’m going to show you the detailed overview of the premium projector Sony VPL-VW365ES. 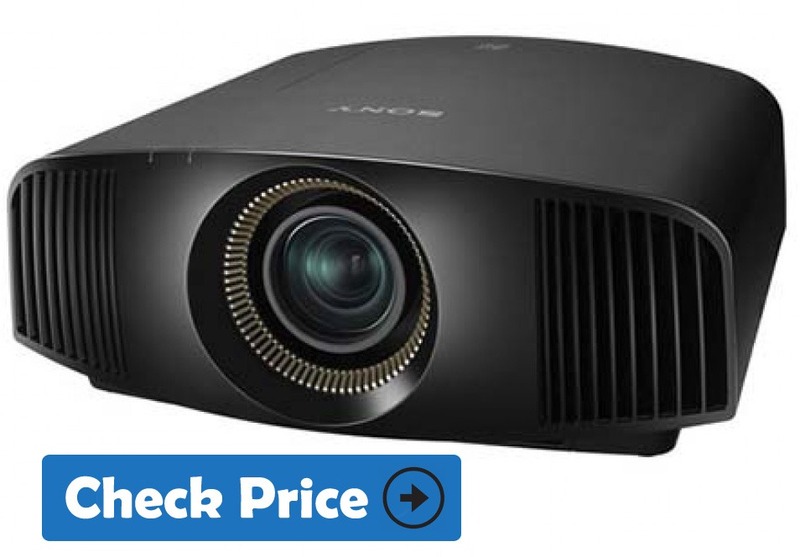 The Sony VPL-VW365ES is a true 4k Home theater projector but a little costly and can burden on your pocket, but Sony has cut off their projector prices since last year. It is the awarded model and supports 4k HDR and deliver stunning picture quality with extraordinary features. The Sony VPL-VW365ES measures 19 1/2 inches in width 7 11/16 inches in height and 18 ¼ inches in length in addition it weights around 31 pounds or 14 kilograms for those who prefer the metric system this projector features an interesting piano black turns the like shape which makes it compact enough for placing it anywhere in your house and it’s suitable for any decor the whole chases is also accompanied with gentle curves and sharp angles so it won’t differ much beyond the rest of the bodywork. The Sony performs really good when it comes to the venting of hot air since it vents from its front edge giving you the opportunity to comfortably place it against the wall without any problem. On the left side as you face the front there are two HDMI inputs which have an HDCP compliance and then higher input with an rs-232 connector which are useful for having an external wired remote control as well as a USB port that is strictly for firmware updates and nothing more the remote control itself is illuminated so it will increase your intuitive experience at nights excluding you from a need to move from a position in order to find some light. I also want to mention that all of the lenses controls such as shifting unless horizontal and vertically adjusting the focus and the zoom is on manual so you can do plenty of adjustments in order to find your ideal imagery at the center you can see the lamp which is truly efficient durable and as Sony claims you get lasts for around 6,000 hours of usage but this varies is everything depends on you use it, either way, the included lamp lasts long enough so it will reduce much-running costs and let you have a maintenance. This model has 1800 lumens of brightness thanks to the 215 watt lamp that works magnificently in delivering clear clarity and vibrant imagery for transforming your home into a real theater there are nine picture presets where each is equally unique and we glue the photo mode gain read cinema additional two cinema film modes cinema digital TV pretty V reference and even an advanced HSV manual color turning tool for the QP with more control which I find extremely act helpful in addition there are also six gamma correction settings but unfortunately neither of them offer a specific fine-tuning option for having a better control over the brightness. However, the picture quality is insanely good this is a result of the many features included such as the color space smooth gradation MPEG noise reduction reality creation motion flow and of course the input lag reduction which gamers are going to find very useful. Yes, it supports 3D with IR based but No 3D glasses are included in the package but you can buy a separate at a very cheap rate. Overall you should take this projector into serious consideration because it is silent feature-rich and flexible at the same time Negi making it an ideal option for you if you are searching for a real cinematic experience.